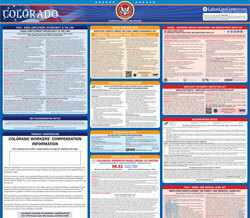 The Notice of Pregnancy Accommodations is an equal opportunity law poster by the Colorado Department Of Labor and Employment. This is a mandatory posting for all employers in Colorado, and businesses who fail to comply may be subject to fines or sanctions. This poster describes measures that must be taken to ensure accomodation of pregnant employees in Colorado. It appears you don't have a PDF plugin for this browser. Please see the link below to download colorado-ccrd-notice-re-pregnant-workers-fairness-act-2.pdf. •  assistance with manual labor; or modified work schedule. the employee paid leave beyond wh at is provided to similarly situated employees. not impos e an undue hardship. This  written notice must be posted in a conspicuous area of the workplace.